Mengel Miniatures: Mini of the Week 6-12-15 and a Charity! This is my favorite type of conversion, the one where you wouldn't even know it's not an official model if you weren't familiar with the mini it's based off of. 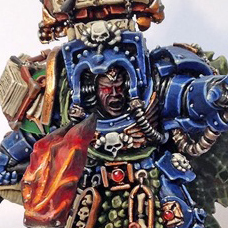 I love how the generic Space Marine Librarian has been made so completely into a member of the Salamanders. It's always nice to see more effort put into customizing a Marine model beyond just painting their armor a different color. The elements used to convert this guy are subtle but important. Both the cloak and the bottom half of his tabard have been replaced to look like a drake skin. I imagine these are from the Dark Elf Corsair kit with some greenstuff work. Another subtle change that helps differentiate this guy from the stock kit was the new head on the staff. There is nothing distinctly Salamander about it, but it's a nice touch nonetheless. The base is suitably scenic as well, with the flames being a particularly nice addition to really hammer home the Promethean flavor. The painting on this guy is top notch as well. It's nice and crisp with bright colors that stand out. Sometimes Salamander faces can look weird with their "coal black" skin and glowing red eyes, but I think it was handled very well here. It looks as realistic and convincing as it can look. Normally I don't include a second photo in these articles, but I wanted to show off the painting on the drake skin cloak. Not only do I really like the shade of green and the brown used for shading, but I also really like the texture painted on to the flat areas. It definitely has a lizard skin feel to it. The last important thing to mention is that this guy was painted for a charity raffle! 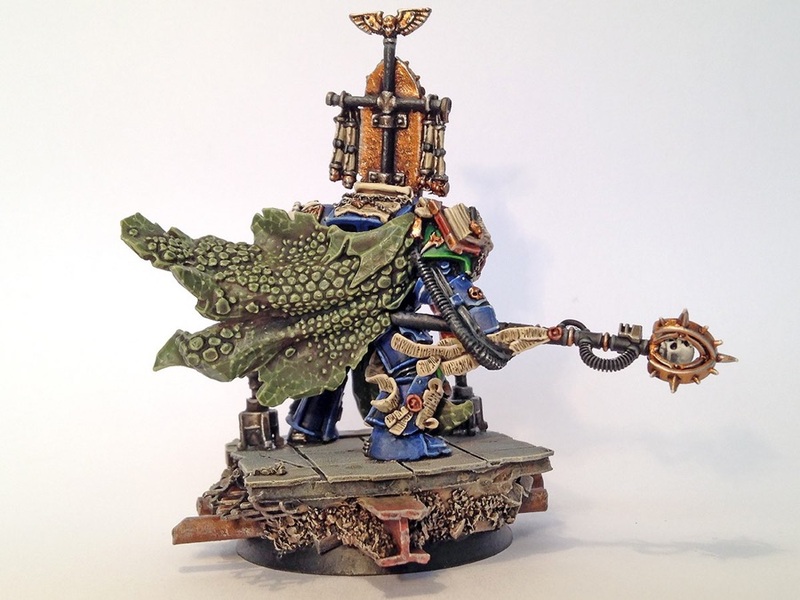 That's right, this model was painted as part of a Salamander's Space Marine army that has contributions from a multitude of hobbyists and painters. The whole army is being raffled off to one lucky winner as part of Rob's WAAC (Wargamer's are All Against Cancer) charity raffle with all of the proceeds going towards Macmillian Cancer Support. You can see what's been finished for the Salamanders army and what's yet to come here. 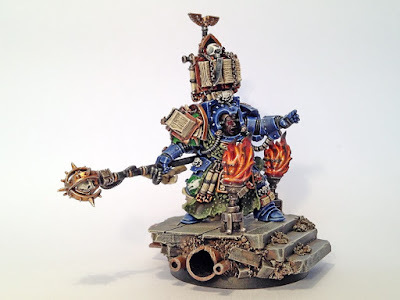 So not only do you have a chance to win a fully painted Salamanders army including the awesome model above, but you'll be supporting a worthy charity and showing that us wargamers and hobbyists can really make a positive difference in the world. So if you want to but a raffle ticket for a chance to win the army, or just to contribute to the charity, then be sure to click the link above or right here! Be sure to check out more views of it on Cool Mini or Not and show the artist some love if you like it. You can also find more pictures and other models at his personal blog, Dark Eye Studios.